After I signed up for the Holy Spirit Novena reminder yesterday (the first day is today for anybody that still wants to join along :)) I realized that the site that is running it actually does a novena every single month that you will automatically continue receiving in your email for as long as you stay enrolled. They correlate the novenas with given Church feasts, and there is usually some commentary along with the novena prayer. I was impressed. I had Day 1 of the Holy Spirit Novena waiting in my inbox when I logged in this morning. The site is Pray More Novenas. I really like it so far. In other news, I'm participating in a spring knit-along, and as is usual, I'm all excited. 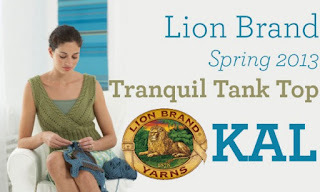 It's being run by Lion Brand yarn, and for anybody else that knits, all of the blog posts are here. I chose a forest green cotton/acrylic blend to make my tank, and I'm already to the armhole shaping on the back piece. Excited. :) I have to say, I'm glad this knit-along isn't a mystery. While I did very much enjoy the Downton Abbey Mystery KAL, I don't know when I'll do one of those again. The same company ran another Mystery KAL for Game of Thrones, which I didn't do because I don't watch that show. And I'm glad I didn't. :) I wasn't crazy about the finished object that it ended up becoming. This knit-along is refreshing. I have the whole pattern, so I know what I'm making and what is coming next. The KAL community simply provides some strategies each week and support via the group on Ravelry. I'm loving it. Thank you for spreading the word about Pray More Novenas! I'm glad you're praying with us!